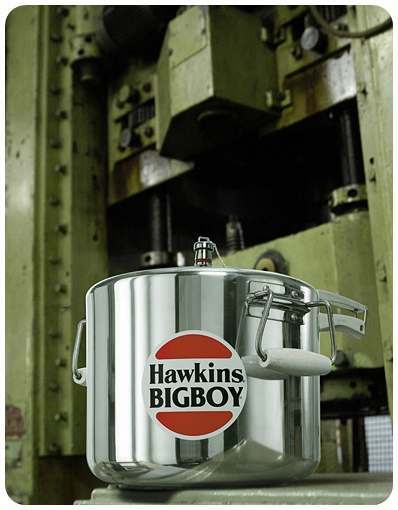 The Bigboy range has been specially designed to cook large quantities of food quickly and economically. It is most useful in restaurants, hotels, canteens in factories, hospitals, schools and colleges. 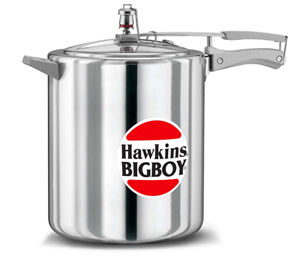 Also, canteens in many civil or military government establishments are using the Hawkins Bigboy. Actual cooking trials in 22 litre Bigboy pressure cookers show that there is a saving of 46% to 57% in gas consumption when cooking 15 to 16 kg of tur dal, chana masala and mutton masala. These quantities will cook in 29 to 48 minutes and would serve 50 to 100 persons.  The savings in fuel alone will pay for the Bigboy pressure cooker in less than a year. 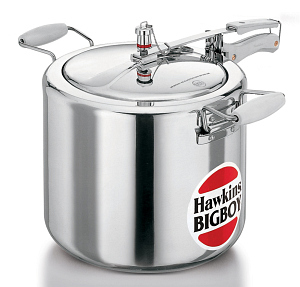 The 18 and 22 litre Bigboy pressure cookers have a pair of sturdy lifting handles attached to the sides of the pressure cooker for convenience in handling the heavy weight carried by such pressure cookers. The plastic handles of all Bigboy pressure cookers are made from reinforced fibreglass for extra strength. 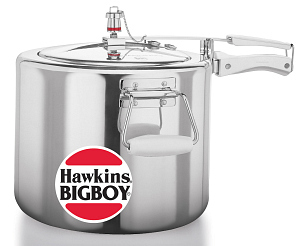 Similarly, all other components of Bigboy pressure cookers are made for heavy duty. A chain is attached to the vent weight to prevent loss in busy kitchens. Recommended for use on gas or kerosene stoves. They may also be used on coal burning or firewood stoves provided a suitable gap is kept between the fuel and the bottom of the cooker.